You are probably just like one of the hundreds of customers we help in leak detection services each and every month whose properties are suffering from one or many hidden water leaks. Our water leak detection services in the UK help many domestic homeowners, landlords, tenants & businesses in all sectors (industrial and commercial) every single day. So no matter what your situation or your location in the UK, you can be sure that we can help you. 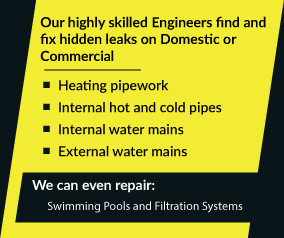 We can trace and repair water mains leaks, central heating system leaks, under floor heating leaks, underground leaks, hot feed leaks, cold feed leaks, ground source heat pump leaks and swimming pool leaks. Water leaks are quite often the root cause of more serious cosmetic or & structural problems and also with the obvious health risks associated with living or working in a damp property. Central heating systems that are being refilled constantly suffer from oxidization – rusting your radiators & pipes from the inside out! Internal water leaks from pipes, tanks, underfloor heating & central heating systems cause an untold amount of damage to your home including damage to walls and floors – costing hundreds to rectify! What may seem like a small problem, a simple water leak can rapidly become a huge problem with extremely costly consequences. Here at ADI, our priority is on locating & repairing your water leak as soon as possible in the most cost effective manner for you. It all starts with a simple call to us as soon as you are aware of your leak. When you call us today and book our services you will be amazed by the value in our service, our prices and with our leak locators “Jedi Skills” (A customers own words in a testimonial) – These Jedi Skills are included as part of our leak find & repair service. Your property will be attended by one of our highly skilled, professional plumbing, heating engineers who’s workmanship is guaranteed to be of the highest quality. 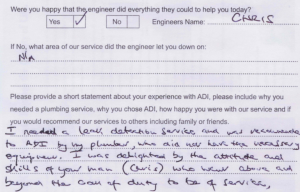 Each ADI engineer is a fully qualified plumber or a Gas Safe (previously known as Corgi) registered gas engineer. This means that you can call us knowing that you’ll be dealing with registered, reliable professionals who have the credentials to prove it. Once our engineer has arrived at your property he will utilize up to 4 methods of technology in order to locate the vicinity of the leak source and then specifically pinpoint the exact location of your water leak. A traditional plumber would use “gut instinct” on the source of your leak, then start removing flooring, plasterboard walls & ceilings and even start cutting into brickwork or digging up your driveway in order to locate your leak. Our leak detectors accurately pinpoint the exact location of your leak without causing any damage to your property! 4) Leak Correlators are used to pinpoint leak locations on underground water mains of up to 600 meters in length using electronic pulses. These are used to detect leaks across large external areas such as yards, farms, fields, driveways, private roads, airports, industrial and commercial car parks – Rapidly speeding up the pinpointing of water supply mains leaks. Once your engineer has located and pinpointed the exact location of your leak without digging or damaging your property any more than your leak already has he will then access and repair the leak at its source. Your engineer obviously has to be invasive to access your actual leak and repair it however you can rest assured that any invasive action will be as minimal as possible. – Only removing surfaces in your property in order to access the exact location of the leak. Once your engineer has repaired your leak he will then test the system to ensure that there are no further leaks – this further testing provides you with complete peace of mind in the services provided by ADI. You will also receive an insurance approved “trace and access” report, this can be forwarded to your home or business premises insurer. Depending upon your policy your insurer should then refund our “trace and access” fee – our service could effectively be FREE! 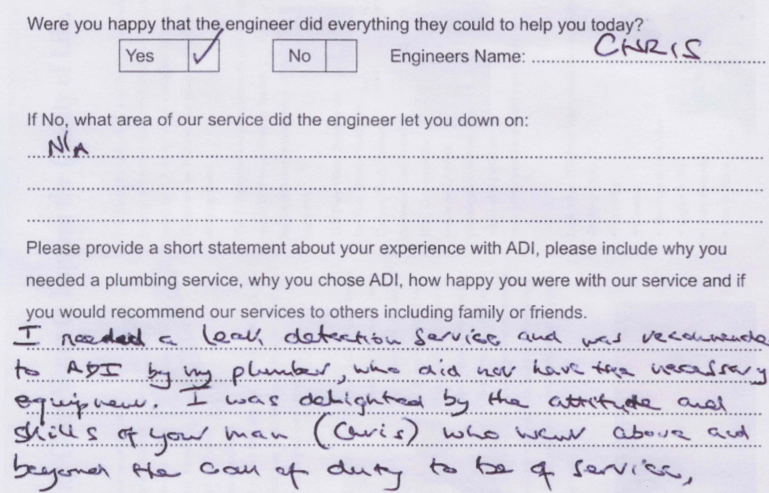 At ADI we are proud to have found the toughest of leaks, in cases where our clients were convinced we couldn’t locate them! Our water leak detector teams have found leaks in schools, hotels, factories, offices, nursing homes, sports complex’s, leisure centres and have even found water main leaks in remote fields! Our clients include David Lloyd Leisure Centre’s, the Guinness Trust Housing Association and The National Trust. Isn’t it time that you called in the UK’s most trusted water leak detection company to locate and repair your water leak? Speak to one of our knowledgeable, helpful & friendly team free of charge on 08007313843 for advice and a no obligation quotation today. P.s Our leak finders can find the simplest of leaks to the toughest of hidden leaks so if you have a simple bathroom leak to a suspected water leak under concrete then you can be sure that we will “We WILL Find & Repair Your Leak” using our customer entitled “Jedi Skills”! Our all in one detect & repair service saves you hundreds or even thousands of pounds compared to traditional methods of detection & repair!